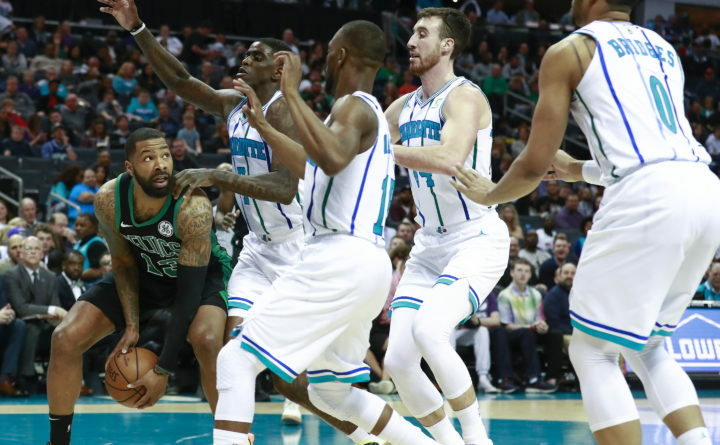 Boston Celtics forward Marcus Morris, left, is swarmed by the Charlotte Hornets defense in the first half of an NBA basketball game Saturday in Charlotte, North Carolina. CHARLOTTE, North Carolina — Charlotte had three veterans out of action and three first- or second-year players in the lineup down the stretch. The Hornets hardly looked like a team capable of rallying from an 18-point deficit against the Boston Celtics.